Hi, it’s me, Pim. I’m happy to share some of my passions with you! One of these passions is obviously Vietnam (among other Asian countries). Ever since I visited the country for the first time in 2006, I fell in love with this beautiful country! 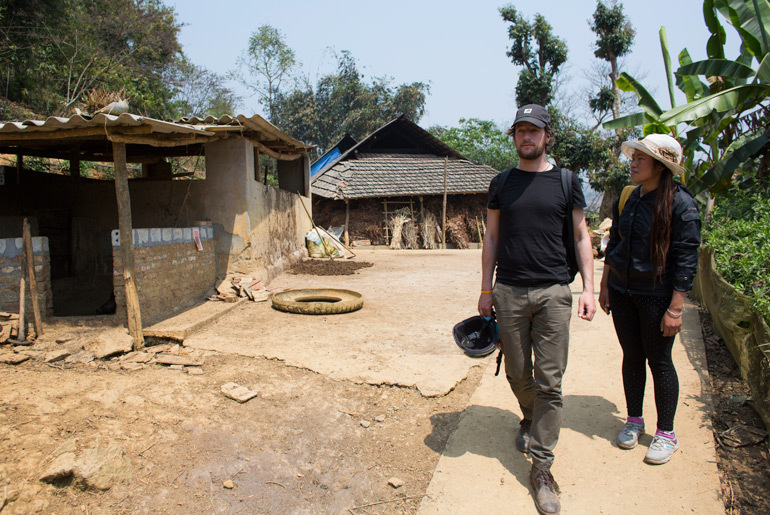 On the photo above, you see me during a field trip, together with my fixer Pang, visiting a rural village in Northern Vietnam. In 2001 I made my first trip to Thailand. That opened up my eyes, never had I experienced such different world from the world I grew up in. From the moment I arrived at Don Muang Airport in Bangkok, I was hooked! Couple of years after, I started my life as a digital nomad, combining my work as a web designer with travelling in Asia. Carrying my laptop from Hong Kong to Bangkok, from Beijing to Ho Chi Minh City, and so on. Even in the smallest remote villages, wherever there was access to Internet, I was able to carry out my work. Most of my clients are non-governmental organizations (NGOs). I worked for Doctors without Borders, Warchild, Greenpeace, Aidsfonds, and many others. See my Curriculum Vitae for more details. In 2010 I decided to go back to university. In 2012 I successfully completed a bachelor in Anthropology at the University of Amsterdam. And in 2013 I completed my Master ‘Contemporary Asian Studies’ at the Graduate School of Social Sciences (GSSS) at the University of Amsterdam. For my Master, I conducted fieldwork in Northern Vietnam, about the impact of homestay tourism on the inhabitants of Ta Van, a small village in the area of Sapa (Northern Vietnam). Please read the abstract of my thesis for more details or download the full thesis here. My thesis was nominated for the IIAS National Master’s Thesis Prize in 2013. In 2017, I studied the Vietnamese language at the Faculty of Vietnamese Studies and Language in Hanoi. Since I conducted my research in Vietnam in 2013, I visit the villages where I conducted my research once or twice a year to catch up with the latest developments in the area and to support some of the local families with their small businesses. Currently I’m in Hanoi (as on February 2019), working on some of my projects. My main goal is to learn tiếng Việt (Vietnamese language) at the Department for Vietnamese Language and Culture in Hanoi. And apart from that, I’m frequently visiting ‘my’ village in the northern mountains again. Whenever you need an social researcher for your organisation who is specialised in contemporary Vietnam, in particular in Northern Vietnam and greater Hanoi, please contact me! I am also available as a ‘fixer’ for organisations and companies who visit Vietnam.